Finding holiday party entertainment isn’t all that hard. Finding GOOD entertainment, well, sometimes that’s a crap-shoot. Now if you are doing a vegas night, you might have everything covered. But a good holiday party can become GREAT with a skilled, professional, talented magician. People love magic. A good magician loves people. Get those two together and you have the ingredients for the perfect holiday party entertainment. The truly skilled magician will be dazzling with his performance, kind with the mystery, and humorous with the show. 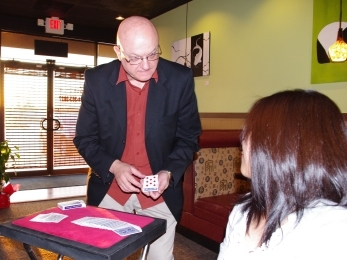 A good holiday party magician can accommodate his routine to fit with the theme of the party. And of course his act would be fresh and new, not some rehash of the 1950’s. Now how do you find this perfect holiday party magician? Simple: check with the event planner from last season’s party. Oh? You didn’t have a magician last time? Hmmm… that makes it a little tougher. Yellow pages? Who uses that any more? Maybe your friends will know. Check Facebook. You could check with the International Brotherhood of Magicians, or the Society of American Magicians. Heck, you could even check with the Dallas Magic Clubs. Wait a minute. Maybe you could check right here, right now. Yes, MrGoodfriend is the perfect holiday party magician. Performing for groups from Europe to Asia, and all across Texas, you will have a great time with MrGoodfriend at your holiday party. But if you inquire and MrGoodfriend is already booked, what then? The best thing is, MrGoodfriend can and WILL recommend one of his talented and competent colleagues. Since many holiday parties involve children, you can be assured that MrGoodfriend is right for your guests. MrGoodfriend has been vetted by the Allen Independent School District for duties on all school campuses. You can additionally check on background checking sites such as Public Data.com. Check with your friends, event planners, or other party professionals. Use the internet and the magician organizations. I’m sure you will have a great time at your holiday party, and I know that it will be MAGICAL!